Data from the House of Commons Library shows the SNP has just under 125,500 registered members, compared to 124,000 for the Tories. As of April 2018, Labour had the highest with 540,000 members. Party membership has risen notably since 2013, both in total and as a percentage of the electorate. A House of Commons Library spokesman tweeted: "The latest available data shows that membership of the SNP (August 2018) has surpassed the latest reported figures for the Conservatives (March 2018)." Political parties are under no legal obligation to publish membership statistics and there is no uniformly recognised definition of membership. The House of Commons Library paper presents party membership data published by the Electoral Commission together with the latest estimates from political parties' head offices, press releases, media reports and academic studies. 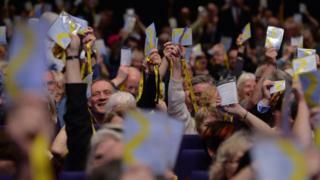 Derek Mackay, MSP and SNP business convener, said: "Over 7,000 people joined the SNP in just five days in June, propelling us ahead of a waning Tory party which is at risk of imploding completely over Brexit. "Like the extraordinary membership surge of 2014 joining the SNP has once again become not just a powerful symbol, but the best way to ensure Scotland's voice is heard. "People were rightly outraged at Tory plans to remove powers from the Scottish Parliament, and that only 15 minutes were given over at Westminster to debate the impact of the EU Withdrawal Bill on devolution." Political parties: Who joins them these days?